Jo-Yu Chen, with her inspired pianism and her originality—as a tune-smith and an instrumentalist—is poised to rise above the dozens of very talented young players into the ranks of the elite group of piano trio artists. Les 25 Meilleurs Disques de L'Année. Les onze compositions personnelles formant cet album, le troisième, affirment une réelle inventivité….Une approche lunaire du clavier qui surprend pour finalement exercer la plus irrésistible des fascinations. Aventureux album…"Stranger" dessine en effet les contours d'un jazz conjuguant avec bonheur des influences très classiques, un zeste d'exotisme, et les improvisation les plus gonflées. Toucher irréprochable….qu'elle entretient des relations privilegiees avec sa section rhythmique (entre elle et son batteur, c'est quasiment télépathique. Souverän reiht sich Chen in die Riege junger Jazzpianisten ein, die weltweit die Grenzen zwischen klassischer Ausbildungsherkunft, regionalen Folklorismen und den Spielformen aktueller Musik aufheben. Jo-Yu Chen Stranger, 4 stars. Il tocco di Chen e sicuro, bruno, ricco di cromatismi e di influenze diverse, compresa la classica contemporanea piu ardita (Fragments). Da er det tydeligere at hun er velutdannet komponist. Hun klarer å lage originale smittende melodier i et melankolsk, litt mørkt sound. Som pianist er Chen både sikker, leken og temperamentsfull. Og ikke så redd for å bryte med det vakre med små og store utbrudd. son jeu fait confiance au silence, se soucie de profondeur. 2014 년 주목해야할, 재즈 피아니스트! 조유첸! 5 stars. Jo-Yu Chen’s fourth trio album “Savage Beauty,” featuring special guest saxophonist Mark Turner, has been released on March 15, 2019 by Sony Music. 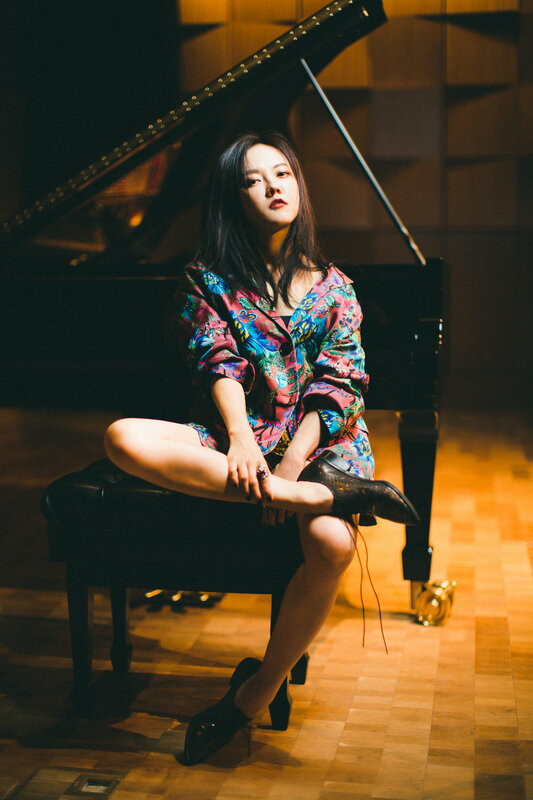 She is the first Taiwanese jazz artist signed to a major record label, and has also joined the distinguished international roster of Steinway Artists. The title composition "Savage Beauty" was in memory of the British avant-garde fashion designer Alexander McQueen. “Musically, I’ve always wanted to express myself as delicate, dramatic, and playful but ultra-powerful. McQueen mixed strength and fragility to create a picture of an empowered woman warrior who is ultra-feminine yet powerful. I found myself deeply resonating with McQueen’s aesthetic approach and the dark romanticism of his style. I also respect how he challenged the market by staying true to himself as an artist in such a commercial and consumer lead fashion industry. “, says Chen. As an artist who pursues creativity and breaks the boundaries, Chen, along with this new album "Savage Beauty" release, starts exposing on various media platforms in Chinese speaking regions. Her new album “Savage Beauty” has been featured on Vogue and GQ fashion magazines and in addition, she is now in collaboration with one of the most luxurious supercars brand, McLaren. British supercar McLaren has had continuous breakthroughs and innovations in the car technology. Wildness may be found in its elegance which matches the concept of Chen’s new album “Savage Beauty” perfectly. She combines the exquisiteness in classical music with uninhibited character of jazz to accomplish her uniqueness. Chen, similarly, matches the same spirit of McLaren. McLaren was born by the race track. It has obtained various success on the race track, later committed to a new field of cars production and continuously insists on pursuing perfection. McLaren’s supercar 570S Spider will also be exhibited in Chen’s concert at Opera House in Taiwan on May 23, 2019. McLaren Taiwan will also attend to celebrate and support the new star in jazz music. Together they will bloom glamorously in their uniqueness and charm. A native of Taiwan, New York-based pianist and composer Jo-Yu Chen began her formal musical training on piano at the age of five. Later, at the age of nine she also began studying the oboe. Despite picking up a new instrument, she always remained deeply committed to the piano. After moving to New York City to study oboe and piano at the prestigious Juilliard School, she discovered a diverse musical scene thriving in the heart of the city and decided to take the leap from classical music to jazz. This adventure began when Chen enrolled in the New School to study Jazz for two years. During that time, she studied with some of today's great jazz piano masters, including Jason Moran, Sam Yahel, and Kevin Hays. While there, her talent was quickly recognized. Chen has been featured in jazz magazines internationally. Her previous Album "Stranger" was voted "25 best albums of the year" in French weekly magazine "L'Express". She received rave reviews in Downbeat, Jazziz, All About Jazz, Jazz Inside in the US and also appeared in Japanese magazines, such as "Jazz Japan" (formerly Swing Journal) as "Star of the Month", and Jazz Critique (ジャズ批評) with a 3-pages in-depth interview. Others include center fold publication in the Norwegian newspaper "Dagbladet" , Macao Daily News (China), Rolling Stone (France), Jazzman (France), JAZZTHETIK (Germany), Jazz thing (Germany), Mnet (Korea), MusicaJazz (Italia), All About Jazz Italia, Jazzflits (Netherlands), Dagens Næringsliv (Norway), Le Temps (Switzerland), China Times News (Taiwan), and Muzik (Taiwan). Along successful release of her albums, she went on to perform at the National Concert Hall (Taipei), Opera House (Taichung), Blue Note (New York), Blue Note (Beijing), Steinway Hall (New York), Bærum Kulturhus (Norway), Muri (Switzerland) and many more. Her performances generated great buzz in the press and were well-received by the audience. Copyright 2019 Jo-Yu Chen. All rights reserved.